The malt industry is one of the many energy-intensive industries. This is mainly due to the drying process that is required to produce malt, since large amounts of water must be evaporated. The enthalpy of vaporization of water at 25° C is 2.546.5 kJ/kg (0.707 kWh/kg of water). If we suppose that 750 kg of water (45% wet basis) must be evaporated to produce one ton of finished malt, then we obtain a thermal energy demand of 530 kWh (or 45,580 kcal/dt) per ton of finished malt. Since the drying process does not proceed ideally in the last stages of drying (due to hygroscopy), the amount of energy that is required is still greater. If air drying is used, then the thermal consumption is 603 kWh per ton of finished malt for the above-mentioned evaporation temperature after calculating for waste heat recovery. 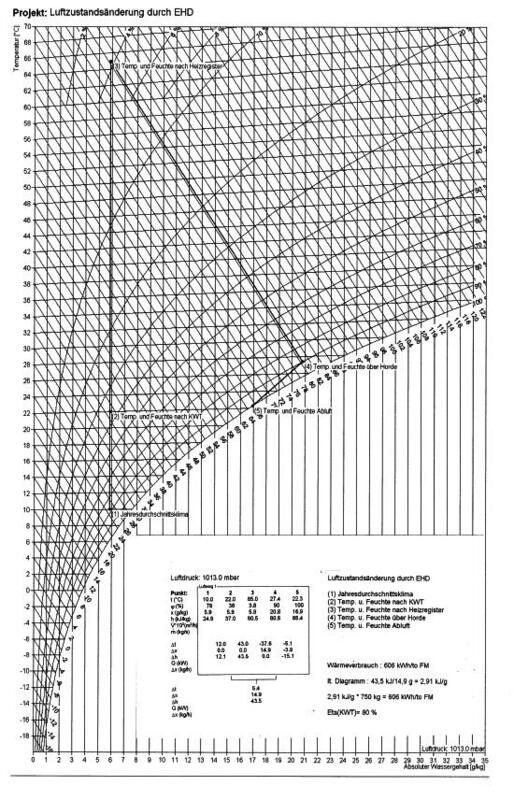 You can find the technical details here in the Mollier h,x - diagram. Given these immense energy requirements, measures to reduce the consumption of electricity and heat are of great importance. The construction of an innovative double kiln in 1988. The use of two air- and heat-coupled single-floor kilns have allowed us to achieve very favorable heat and power consumption values. This first air flow reversing kiln still represents the best possible state of the art in malting. In 2007 we commissioned a cogeneration unit that runs on vegetable oil. This provides us with another heat source for our malting plant within the framework of a contracting procedure. In 2010 we invested in a newly designed cross-flow heat exchanger (HiF-KWT), which has a greater temperature efficiency compared to the old design given the same pressure loss. The installation of steeping tank water heaters has allowed us to further reduce heat losses attributable to the exhaust of flue gas. Kling Malz was the first to implement this idea, and it quickly spread throughout the entire industry. In 2011 we invested in the construction of a refrigeration plant in Edingen. Change to the more environmentally friendly refrigerant R134a. In 2016 we invested in a new burner, which has a greater control range than the old one, which has allowed us to further improve the energy efficiency of our interconnected operations. In addition to these technical investments, we also introduced an effective energy management system. 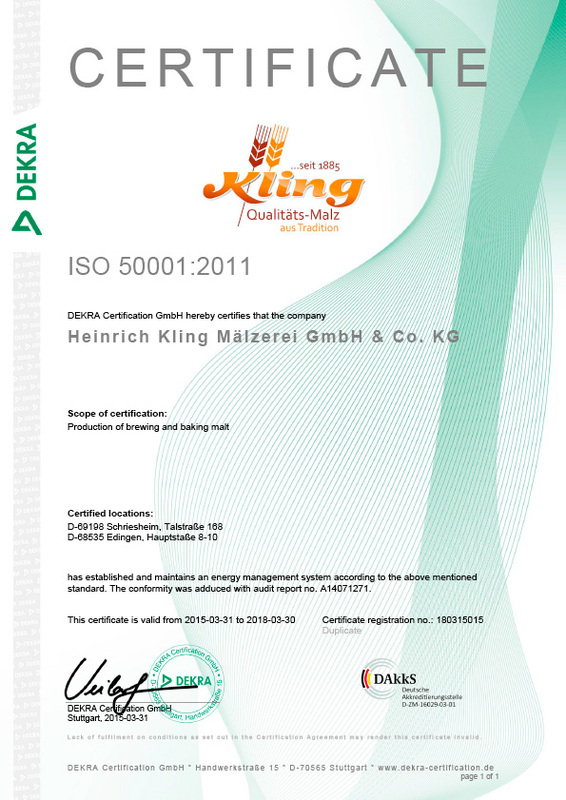 Both production facilities achieved ISO 50001 certification in March 2015.